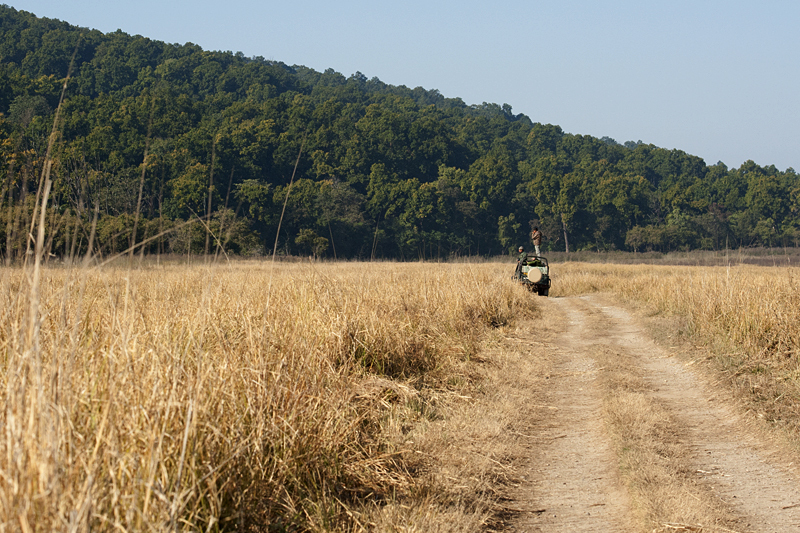 We began the final safari of our visit to Corbett National Park, into Dhikala Grasslands. Given that we sighted a Tiger last evening on Sambar road, we decided to take our chances today morning on the same road. We drove for about thirty minutes and had covered almost the entire stretch of the Sambar road without any sightings of birds or mammals. As we approached the end of the road, I spotted what I thought was the tip of a Tiger’s tail and almost simultaneously the naturalist too spotted it and shouted “Tiger“. Ritish immediately braked and switched off the Jeep. 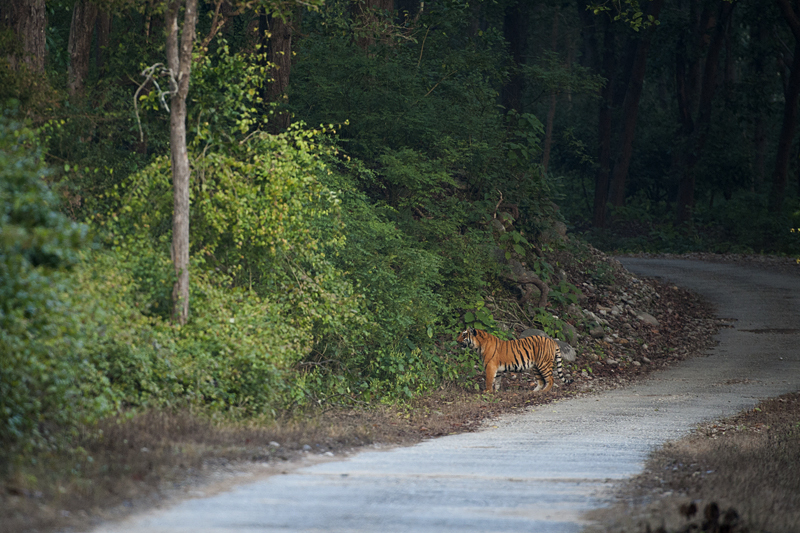 Only the naturalist and I had seen this Tiger walking alongside the road a little ahead of us. We lost sight of it since the road ahead bends to the right. Ritish started the Jeep and slowly moved ahead to the bend on the road. But alas, the Tiger had disappeared, nowhere to be seen. The naturalist and Ritish had a discussion on where the Tiger would be headed and since we saw the Tiger on the right side of the road, we took the decision to take the right turn and come onto the main road leading back to the Dhikala Grasslands. Once we were on the main road, we switched off the vehicle and waited for the Tiger. We waited for another thirty minutes and when the Tiger did not show up, we decided to move forward. 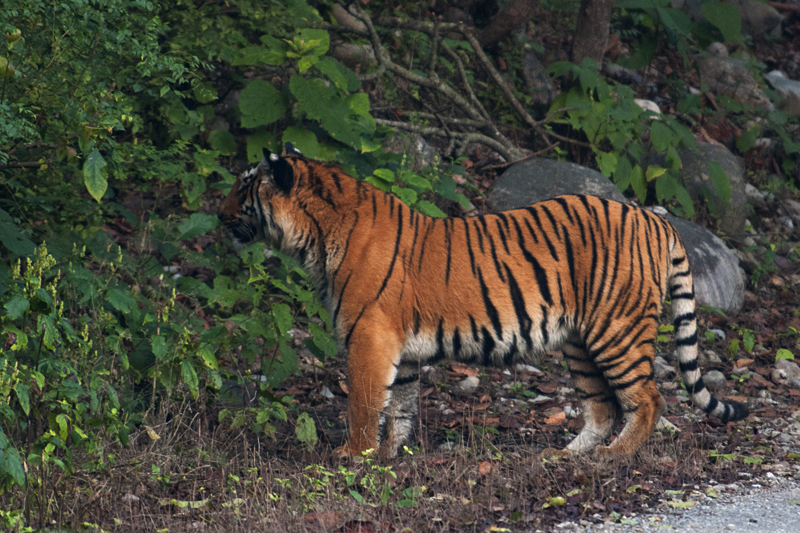 We just drove a few meters and there he was, a huge majestic male Tiger standing about fifty meters ahead of us. He was sniffing something on the ground and then was smelling the air in the direction of the forest. We knew he was trying to catch the scent of another Tiger that has recently passed that way, maybe a female. In the couple of minutes that we saw him, he gave us just a single glance. Soon he disappeared into the lantana. We then drove ahead to the spot that he was smelling and saw the scratch marks at the spot where a Tigress had scent marked (left urine). We inferred that this was a female Tiger that was leaving behind scent marks so that a prospective male would track her down soon. This was indeed the season for Tiger mating. 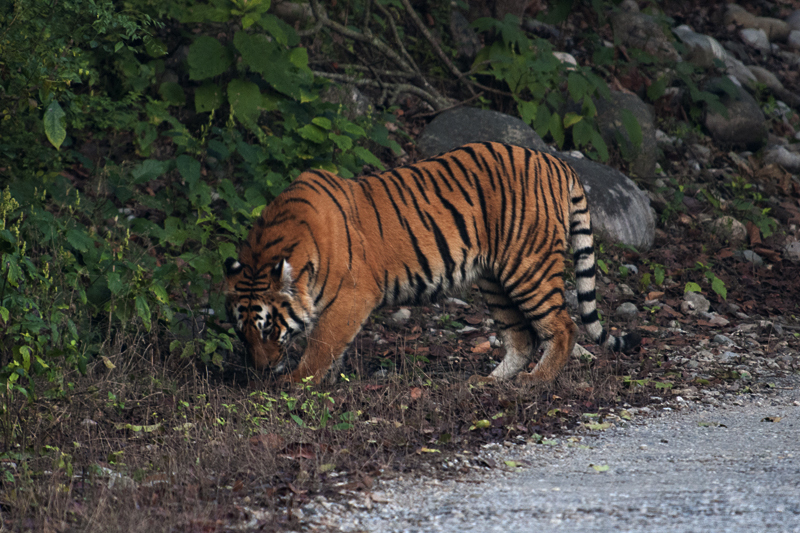 We thanked our lucky stars for tracking down and spotting this Tiger. Since we were leaving Dhikala today, we decided to drive back to the lodge, finish breakfast and checkout. After checkout, we drove one last time into Dhikala Grasslands. 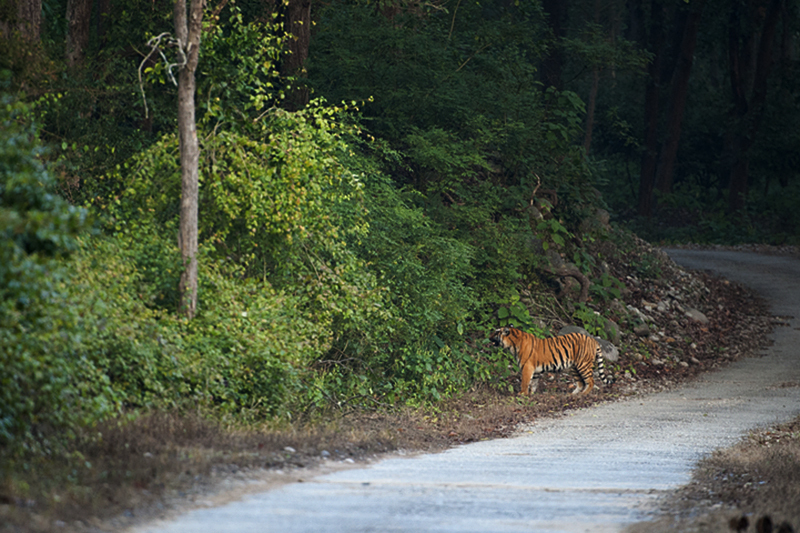 We soon noticed a Jeep parked ahead on the road with everyone scanning the forest landscape. When we heard the Chital (Spotted Deer) alarm calls, it was clear the folks in that Jeep were trying to spot the Tiger that the Chital was warning everyone about. Ritish told us that he had spotted two Tigers together in this area on his previous visit a few days back and maybe they were still in the area. We were excited as the last time we saw a courting pair of Tigers was in Tadoba National Park. However after about ten minutes of waiting, we decided it is time to bid farewell to the Dhikala Grasslands and begin our two hour drive through Corbett National Park to exit the park. What a fantastic sight. Looking at the image I can feel the thrill you must have had seeing that majestic cat. Exciting experience. Those are beautiful captures of the tiger. Amazing photographs of this wonderful encounter.